This isn't called the No. 1 Best-seller for nothing! I have been a loyal Shu Uemura and Shiseido Eyelash Curler user for YEARS! Shu Uemura for most clients with curvier eye shape while Shiseido is perfect for those with extremely small eyes! After trying out Koji Curving Eyelash Curler, I had to include this in my professional kit and purchase another one for myself! Specially made for Asian Eyes. Creates a natural looking curled lashes. Rubber doesn't wear off easily. Comes with its own packaging. Has 2 free rubber replacement. Works for most Asian Eyes. Used on clients and myself, the result is great! The design is completely different and unique from other Lash curlers I've tried. Has longer body and handle so easier to hold. Has flat edge metal head making it easier to grasp each lash hair without pinching the lid. Gives off naturally curled lashes. The rubber pad is soft. No need to lift my eyelid using the other hand to prevent the curler from pinching my lids. It grabs almost ALL of my lashes with ease. "Curved" eye shape may not appreciate this as much as those with small eyes. My favorite eyelash curler to date! It works so well on my eye shape! It helps to test on eyelash curlers before purchasing them because each individual has unique eye shapes. If you tend to "pinch" your eyelid whenever you curl your lashes, lift your eyelid gently using the opposite hand. If you own a lot of eyelash curler with a lot of spare rubbers, label them so that you won't get confused. Always start curling the lashes starting from the base with 3 step up to the tip. Asian eyes with short, sparse lashes. Available at the ff. stores priced at Php899.75 (approx $20.00) each. 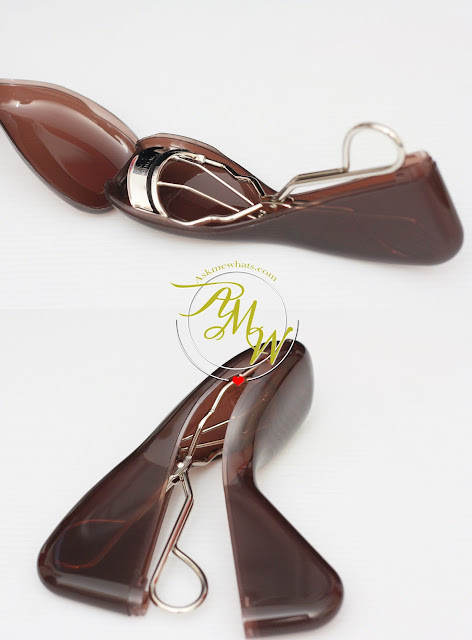 Koji Curving Eyelash Curler with plastic container. I wish all lash curler brands will create one. Comes with 2 extra rubbers. I like to store my eyelash curler after every use now! The body is longer than regular lash curlers. The metal base is flat thus making it easier to grab more lash hairs. 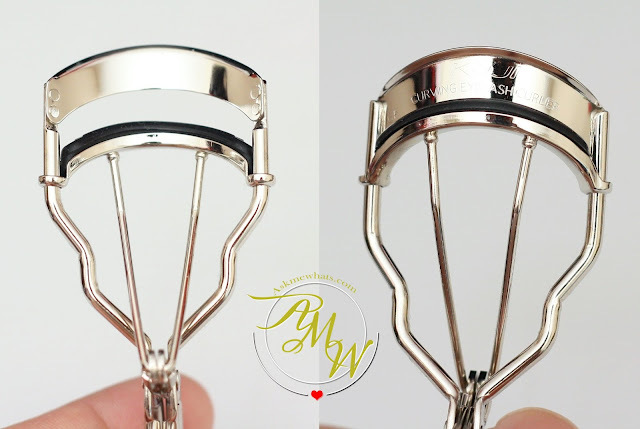 Overall, this is a Holy Grail Eyelash Curler for me to date! Believe it or not, i don't own an eyelash curler. I never felt I needed one but this actually makes me want to get one. Was waiting for a local review for this as I've been seeing this in Landmark (Trinoma). I guess I should ask them if I could try it out. I have big round eyes kasi and I was wondering if this would work for me. Wahh it has a case/ holder which is ♥. Fortunately I'm proud of my naturally curled lashes one of the hands me down I got from my Mom yet, I hope she didn't give me a sparse lashes lol so it is mandatory for me to fan out my lashes so it will look lush and full. Still, I want to invest and have one for myself I'm tired of using spoon to fan out my lashes (this is the only trick that I have more control I have a fair share o pinching my lids with eye lash curlers) because I need to do it carefully to have an even result.